Ever heard of pulling a loose tooth out with a door and a string?? 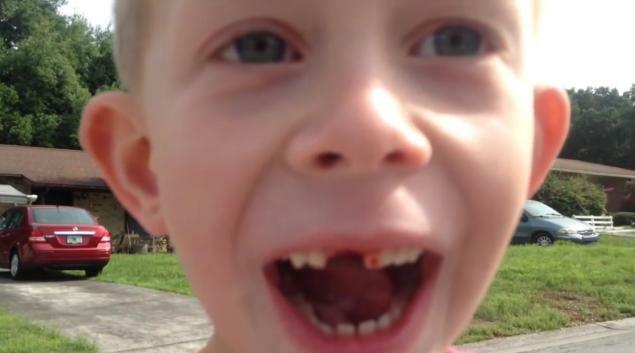 Well, this Florida dad took it one step further by tying his son’s tooth to his Chevy Camaro! In the video which has been uploaded to Youtube, we see Robert Abercrombie of Tampa, Fl tying a string to his 8 year old’s son Jason’s tooth. Within seconds, Abercrombie– who is also a professional wrestler known as Rob Venomous– hops in his car and stomps down on the gas, pulling the tooth clean from his son’s mouth. Surprisingly, since the video has been released, the family has actually been getting positive feedback, as the video has collected millions of views across the internet. With the omnipresent PC groups out there, even the father wasn’t expecting that! “I was skeptical of how people would react, but it got (a) pretty good response!” Abercrombie posted on his Facebook page.